OH! RPG! created by Bidai Core Team. - After a lengthy-ish cut scene you’ll wind up in a Church. 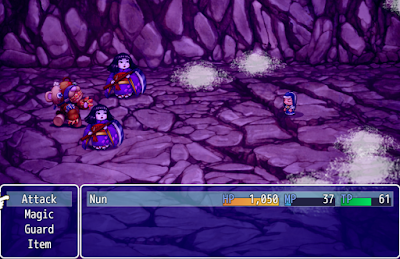 Here you’re playing as the Nun, a benevolent soul with an array of magical skills that make her a little more complex - and strategically-interesting - than the other characters. She’s also rather weak to start off, so this chapter will be a step up in difficulty. - Once the cut scene is done you can look around. A chest on your left contains Bread, and a chest to the south contains a Cross Necklace. You can swap between the Necklace and the Nun’s Rosary to up her defence and special defence, respectively. Given how devastating curse status can be in this chapter (can’t heal yourself! ), I highly recommend equipping the Cross Necklace. North of here is a chest; if you pop it open (against the wishes of the heroes) you’ll find two Hi-Ethers. - You’re meant to use the western exit to continue your quest. If you want a bit of side questing goodness, however, take the door in the northeast of the Church. 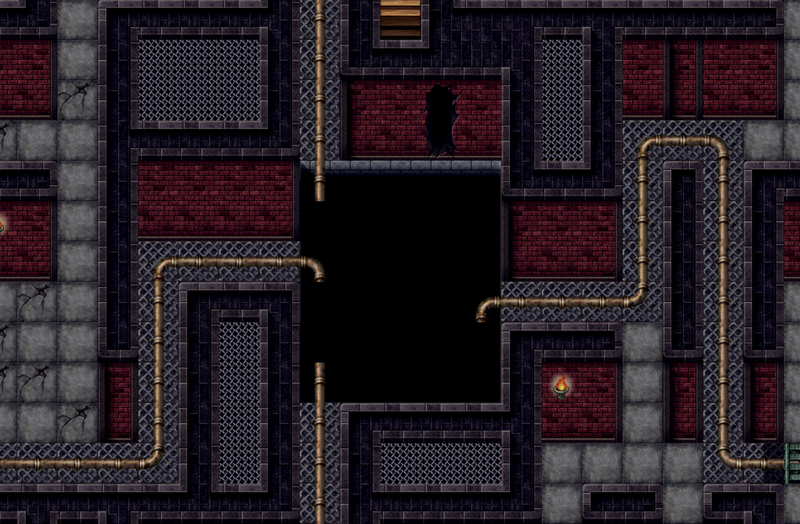 Even if you don’t want to undertake the side quest you can find a Dark Bell in the room up here. The water supply area of the Church in OH! RPG!. Use this diagram to plot where each pipe goes. The maze you need to traverse to reach the pools is rather twisty-turny, so this may take a while. You can find an undecipherable stone tablet along the way, as well. Once you’ve dumped all four ingredients, return to death and he’ll give you some Empty Bottles. Fill them up at the four pools for Mint, Ginseng, Liquorice, and Green Tea Perfume, then speak to Death again. He leads a stressful life. Battle time! Now Death wants you to spray him with each of the Perfumes in the proper order. When he complains about work or seems angry, hit him with Green Tea; when he weeps or complains about his weight, use Liquorice; if he coughs, pull out Mint; and if he’s lacking in energy and / or sleepy, go for Ginseng. Using the wrong Perfume will push Death to attack you, so choose wisely. 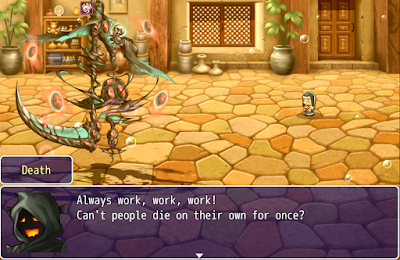 If you manage to fully restore Death’s health with the correct Perfumes he’ll give you an Herbal Tea, a powerful item you should save until the final battle of the chapter. - Leave the Church. Before heading south to the entrance of the Dark Forest, look around the facade of the building. There’s a chest containing Holy Water to the east and a Water Lily in a pond to the southwest. Holy Water provides the upgradeable healing services you’ve come to expect in OH! RPG!, while you can combine three Water Lilies into one. 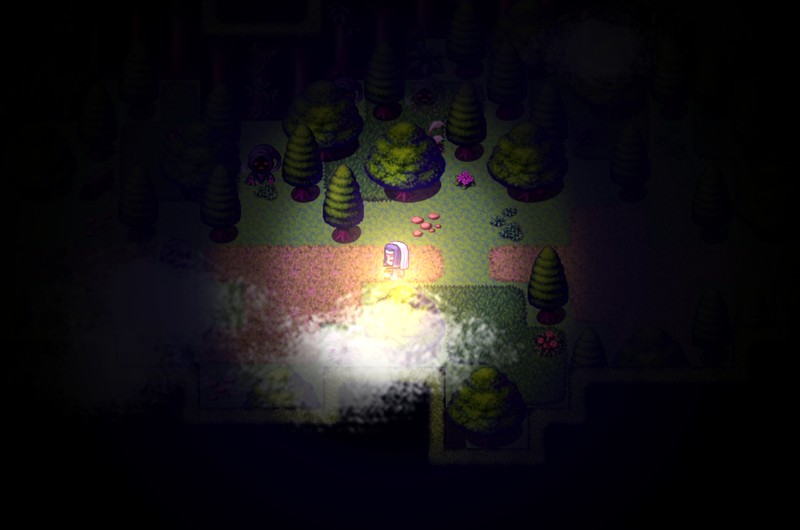 - You’ll hit your first proper encounter of the chapter as you head into the Forest and wander west. 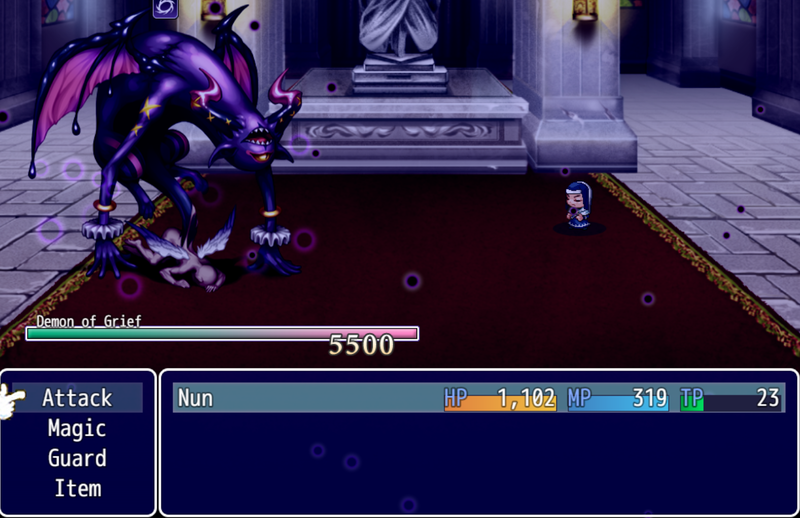 The Ghost you fight isn’t particularly tough, and when you weaken it enough with normal attacks (around two-thirds of its health gone is usually enough) you can finish the fiend off with Bell. Note that the Nun is somewhat unique in that she can use Sacred Word to absorb MP from enemies, providing you with effectively unlimited healing, as she can use magic to restore herself. Sacred Word will also give you Blessings, used to upgrade Holy Waters. - West of the Ghost is the beacon you saw at the beginning of the chapter, and past it the spooky music sets in. You’ll find a locked chest near a diagram similar to the one by the beacon, though simpler. 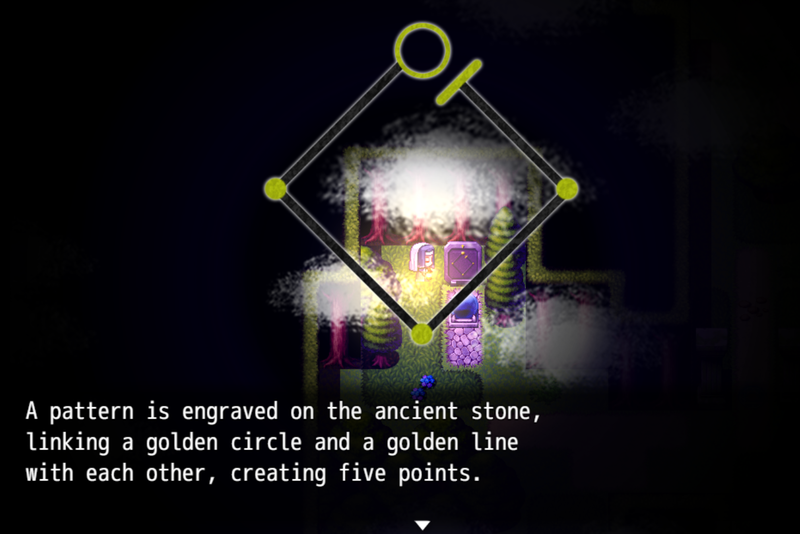 This denotes a little puzzle involving your Bell, which is under the Key Items menu. Use it beside the diagram, then choose Left, Right, and Stop Ringing to open the chest. It contains a Holy Water. Note that you can open beacons with the Dark Bell you found earlier without the normal Bell puzzle, but you’ll sacrifice your User Rank points if you do so. Not worth it. - There’s a pond to the west containing a Water Lily. North of here is a second beacon, with another diagram to follow. This time you need to choose Up, Left, Down, Right, and Up. Doing this successfully will open a path to your right and allow you to continue. - The path splits to the north, and if you take a right you’ll be assaulted by a pair of Spirits. They use normal physical attacks, and aren’t much of a bother, aside from their irritating evasiveness. Use normal attacks followed by Bell to take them out. They may drop Spirit Dust upon defeat, and, if you’re lucky, some Residual Energy. The Forest twists and turns, but most of the paths are blocked off, forcing you to head north. Be ready to face a pair of Ghosts ahead; Call Ralph! and a quick Bell will end this battle easily. The Bell puzzle in OH! RPG!. Or one of them, anyway. - In the northeast you’ll find a pond with a third Water Lily. If you combine the three you’ve found you’ll get a Goddess’s Purity, an armour upgrade that will help improve your Nun’s survivability. To the right of the pond is another tablet-beacon-and-bell combo. This one is Up, Down, Right, Left, and Up. Check the crucifix to the west of this beacon for a Spirit Substance. - This beacon will undo a seal on a path to the south. Look for pillars on your right to know which way you have to go, then head east. (You’ll know you’re going the right way if you see emptied chests.) South of the pillars is a fight with a Ghost and a Spirit; they’re protecting some Holy Water. There’s a battle with two Spirits and a Ghost to the east of the pillars - you’ll find another Water Lily south of the monster - and, to the northeast, waits a green beacon. This pattern is Right, Left, Right, and Up. North of the beacon are two more Water Lilies. - Return to the pillars and go west. You’ll find more pillars that were previously blocked by a seal. They watch over another Water Lily and a purple beacon. This time the pattern is Right, Up, Right, Left, and Up. - Head back east to the previous set of pillars, then go north. The path will split after a bit of meandering. There’s a chest to the north with four Dried Nuts inside, and to the west you’ll hit a battle with three Spirits. There’s an Enchanted Vial just north of the Spirit battle, very handy for restoring MP, and you’ll find a path out of this spooky section of the Dark Forest to the northwest. - Once normal forest noises reassert themselves you’ll see pillars to the north. Check to the right of the pillars for Dried Nuts. If you wander further east from this chest you can find a hole in the ground, partially hidden behind a tree; this leads into a creepy cave. Inside you’ll find Cursed Cloth. This piece of armour grants a substantial boost to your magical attack power, but your defences will suffer. It’s already hard enough to keep the Nun’s health high, so I don’t really recommend the Cursed Cloth. - You’ll find the Cliff north of the Dark Forest’s final screen. There’s a Water Lily on your right, and straight ahead is the last beacon. Down, Up, Down, and Up will do the trick… though it also gets you thrown off of the Cliff. - Once you regain control of the Nun, check the pool to your right for another Water Lily, then head down to the beach and wander east. A northeastern path will take you to a chest containing four Dried Nuts and an ominous-looking cave. - Head east inside the Sinister Cave. You’ll shortly be pulled to a rather spooky sight of six coffins arrayed in a row. The Nun will comment on the chime playing in the background, and you can mimic the song with your Bell. Hit Right, Right, Down, Left, Right, and Down. This will make an NPC appear. Speak to him and get ready for a fight. A toy-based boss battle in OH! RPG. Well isn’t that gruesome. These three toys look pretty tough - and they are - but they have a major weakness in that they’re susceptible to the Appeal command, which you learn upon entering the fight. Using Appeal on one will temporarily put it on your side and force it to attack either itself or its comrades. You can use this to cut down on the abuse directed towards the Nun, and, eventually, take them all out. Heal as necessary. You can Hero Call the heroes if you wish, but all three actions require eleven turns to reach you, so you’re going to want to use Appeal to ward off damage either way. Having trouble? Perhaps the best way to win this battle solo is to target the Teddy Bear first, and to use the Nun’s otherwise-useless Scissors attack. This will deal massive damage to Teddy and take away about half its health. This will also remove Scissors from the Nun’s repertoire forever, but, oh well. Teddy will occasionally heal you, so perhaps don’t use this attack right away. You’ll get two Spirit Porcelain and a Cuddly Heart for besting the enemies. Defeating them will also drop a rope down into the west side of the Sinister Cave, allowing you to ascend to the area where you found the Cursed Cloth earlier. 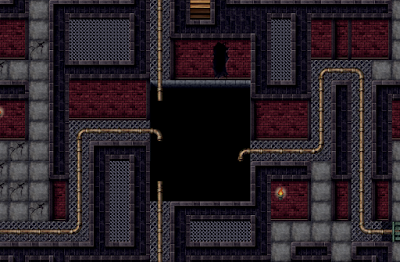 From here you can backtrack to the Church, which, quite immediately, you’re pushed into another boss battle. You get one chance to muck with your equipment, so upgrade the Holy Book with the Porcelain and use the Cuddly Heart to fully restore yourself, then get ready for the end of the chapter. The Demon of Grief, the final boss of OH! RPG! 's Dark Forest chapter. Also, one of the more frustrating bosses. Damnable RNG! The first, as ever, is the easier Hero Call route. Lucius provides a bevy of useful spells, but he can’t hurt the Demon of Grief until you’ve done sufficient damage yourself. Until you have, he’ll heal you for around 500 HP, which ain’t bad. Use Banish, Prayer, and the occasional Holy to smash the Demon of Grief. Holy Shield is probably the best of the lot for the entirety of the battle and if you got the Herbal Tea at the beginning of the chapter you can use it to reflect three attacks back onto the Demon, which makes your job much easier. Once Lucius can attack, Holy Judgment will make it susceptible to Spell of Abolishment. Going solo is much harder. You’ll have to rely on items (hopefully you still have all your upgraded Holy Waters) and Prayer for healing, then use your strongest magic attacks - Banish, most of the time - to defeat the Demon of Grief. Spirit Dust will keep your magic attack high enough to make sizeable dents in the thing’s health, and casting Sacred Word will demolish its MP to the point that it will eventually stop using anything other than its normal attack. Get rid of this MP to make the fight predictable, if not necessarily easy. You are not safe if you’re below 600 HP and Demon of Grief can still use spells, so keep your health as high as possible throughout the battle. Like other spiritual creatures, you need to get the Demon of Grief down to around 2,000 HP or so before you can banish it with Spell of Abolishment. Besting the Demon of Grief will end the chapter. One more to go...! After I tried it, I can tell that the cursed cloth IS cursed anyway: which means it prevents you from any HP/MP healing even though you don't have any status ailment shown on your profile, AKA impossible boss.